My paternal grandmother, Belle Feinstein, was born on August 14, 1914 in St. Louis, Missouri. The second child of Herman and Anna (Blatt) Feinstein. As a child, her older brother, Bernard (Benny), gave her the nickname, Sissie. The nickname remained with her the rest of her life, and ultimately the only people who referred to her by her real name were those who didn't know her, such as telephone solicitors. As I mentioned last week, she secretly married my grandfather, Melvin Newmark, on May 10, 1936. They had another wedding 8 months later, and it was many years before anyone found out about the first. 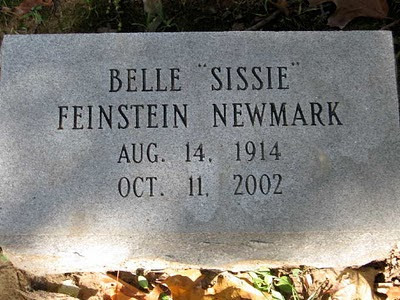 She passed away on October 11, 2002, and is buried at United Hebrew Cemetery in St. Louis.